After being told that previous pictures didn't do justice to the sweater's size and color, I'm trying again! Remember how I started these socks because I had extra yarn? Well, turns out that I didn't have quite enough to finish the tippy-toe of the second sock (of course). I ended up buying another ball of yarn to finish it. I couldn't just let that first sock be lonely! Shhhhhh, don't tell Henry size matters. We wouldn't want him gettin' any complexes in infancy. :) The sweater is FAB, no matter what color it truly is. Why did I think it was navy??? Hey! 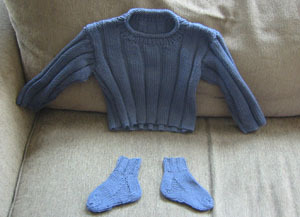 NOW I can see the real size of the sweater! :) Of course, seeing it in person made it clear as a bell to me! haha! I think you should make your boyfriend one too! It's a great sweater, no matter what size it's in. did you get that adorable soft, cuddly chemo cap done? and did you get to sleep at all? ?